Inspector NottyK Bengali Movie All Songs Lyrics: Inspector NottyK is a most anticipated romantic comedy movie directed by Ashok Pati produced by Surinder Films, Jaaz Multimedia, Walzen Media Works & Jeetz Filmworks. Jeet, Nusraat Faria, Kharaj Mukherjee, Supriyo Datta and Others. 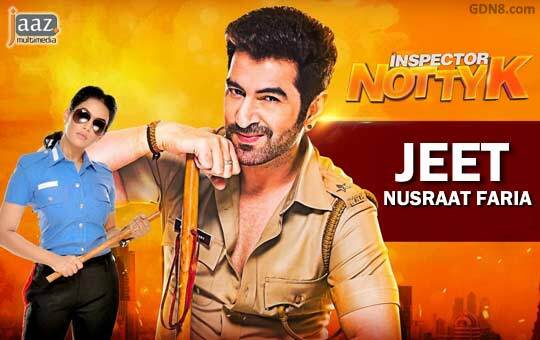 News about Inspector NottyK Bangla Movie All Song Lyrics Lyrics: Great news for all "Jeet" lovers, He is come with his new movie Inspector Notty K is Romantic and Comedy movie coming 2018. starring: Jeet and Nusraat Faria is lead roles in this movie. Producers: Jeet, Nispal Singh, Gopal Madnani, Amit Jumrani & Joydeep Roy Chowdhury. Edited by Md. Kalam. Jeet and Nusrat Faria's 2017 super hit movie is "Badsha The Don" & "Boss 2".